How to tie the Boom Hitch Knot. The Boom Hitch is an attractive and functional knot that provides a very secure method of attaching a rope to a sail boom or to any fixed object such as a fence rail, tree limb, or a pipe. The Boom Hitch can be a good choice for securing one end of a line before tying down a load using a Trucker's Hitch. 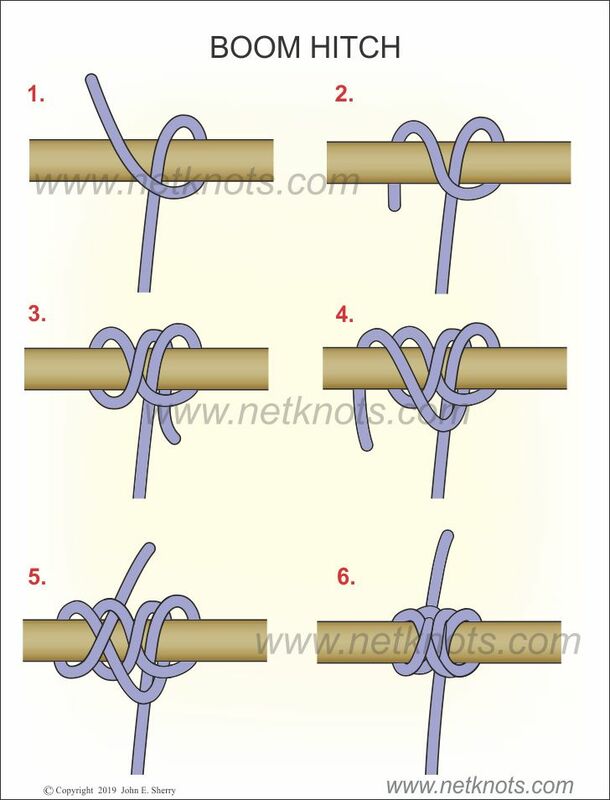 It is very simple to tie with consecutive wrapping turns and then a final tuck through to secure the knot. This trusty knot also works equally well wet or dry. Optional: For extra security, tie a stopper knot at the end of the working line after the Boom Hitch is complete. See the animated Boom Hitch below the knot tying tutorial. Bring the working end of the rope over the top of the boom or post, wrap behind and then cross over the standing end in the front. Wrap across the post in the opposite diagonal, front to back and between the two existing knot parts. Cross the working end over the front of the standing line again and wrap diagonally over the post, this time moving right to left. To finish the knot bring the working end to the front, cross the post and feed the working end through the prior wrap (not the wrap just made) at the top of the knot. Pull the knot tight and work all the wraps nice and close together but maintain their positions. Give a tug on the working end then pull firmly on the standing line. Optional: For added security a stopper knot can be tied in the tail end of the working end.